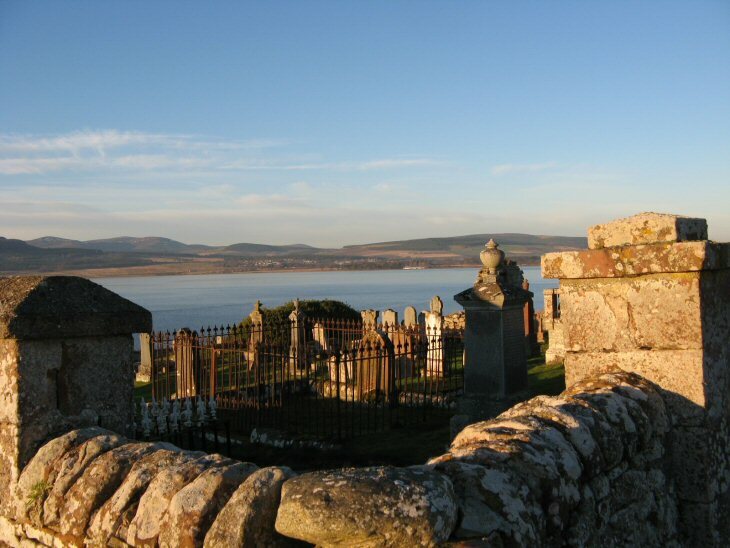 This small, but ancient, burial ground is at the northern end of a farm track on the shore of the Cromarty Firth. The parishes of Cullicuden and of Kirkmichael were amalgamated over 300 hundred years ago. It is now part of Resolis parish. I visited this cemetery in 2009 from Australia, with a distant relative who lives in the area as he could show me the grave of our great grandfather, John MacLeod of Springfield, who was buried there in 1921. Also in the same grave are two of his children, Kenneth and Christine?. All of John's other children emigrated to Canada between 1911 and 1926, when his widow Margaret left with the youngest children. My grandfather Murdo, was one of the boys who left in 1911. It is the most peaceful, beautiful graveyard to be buried in and I loved being able to visit. My cousin's daughter, living in Scotland at the moment, also plans to visit this year. Added by Donalda Davidson on 04 August 2012.